Several rumors have stared swirling around Ben Higgins' love life following his split from Lauren Bushnell, but is he actually dating someone? E! 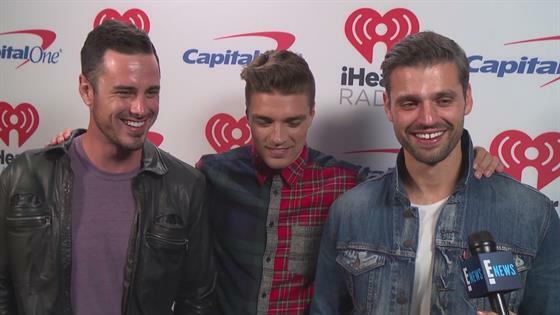 News caught up with the former Bachelor star at the 2017 iHeart Radio Festival in Las Vegas where he revealed that while he has dipped his toes into the dating pool, he's not even close to settling down just yet. Higgins was previously engaged to Bushnell following his run as the Bachelor during season 20 of the show. However, they called things off in May, and Bushnell has since moved on with Devin Antin. As for the hunky brunette, he says he's happy to finally start moving forward. "Life's been a little crazy for me, and it took me a while to get my mind and heart back in the place to start dating again," he told us. "But I'm starting to, and I think that's the best step. I didn't know how to start, and I'm starting. But that's about as far as it goes. There's some great people in my life. Hopefully soon I will be able to show somebody off." Meanwhile, Higgins also opened up a bit about his feelings regarding the newest Bachelor, Arie Luyendyk Jr.
"He's going to do fine," he said, though he admitted he thought Dean Unglert and Peter Kraus would have also made for two great options. "I think Arie is going to do great. He's a little bit of a mystery, right? He's got a great story, a great background, a great family. He's old enough to be mature enough to go through this process and really try to find somebody." However, Higgins brought up the question we've all been asking since the announcement. "None of us know anything about him, and I think that's the big question: Is anyone going to tune in? Because they don't know anything about Arie," he said. "I know nothing about Arie!" Still, Higgins could offer one bit of advice to the new face of the ABC franchise: "Just be yourself." Is Peter Kraus Open to Being the Next "Bachelor"? "It's such a difficult process, and really the only way to do it is to be yourself and be genuine," Higgins continued. "If you're really looking for somebody, you can't do it wrong. It's the whole setup of the Bachelor. At the end, if you're going to get down on one knee, you want to look back and make sure you did it to the best of your abilities." We also caught up with Kraus at the festival, who admitted he's still open to taking on the role of the Bachelor in the future. "If the timing is right and I'm in the right place in my life, yes absolutely," he said. "Talking to Ben in last 24 hours since I met him, he's genuine, he's kind. That's what I try to be myself. So I feel like if he can do it, then that's something that I could see myself doing as well."